USB Type-C (or USB-C) had its coming-out party quite late—at this year’s CES in early January, even though the connection type made its broad debut with Apple’s 12-inch MacBook in April 2015. Since then, more devices have adopted the format, such as the Chrome Pixel C and Nexus 6P. (The new Apple TV has a USB-C port but only as a connection option for debugging and making screen captures with a Mac.) An ocean of USB-C devices is coming that will include more Macs as part of the Thunderbolt 3 update—which relies on that connector style—and possibly some iOS hardware. I’ve been waiting to test USB portable batteries equipped with USB-C since the MacBook shipped. But as long as Apple relied on the MagSafe connector, you couldn’t get a licensed and certified adapter that would work with a Mac laptop. USB-C changes that altogether. It has bi-drectional power support, allowing energy to flow from a laptop or other controller’s USB-C to charge or power external devices and via USB-C to charge a MacBook or similar device’s internal battery. In general, USB battery packs used to have limited capacity, offer slow charging of devices and recharge slowly, and cost and weigh a lot relative to the benefit they offer. But they’ve matured very rapidly over the last few years. With the very large-scale manufacture of standard-sized rechargeable lithium-ion battery cells, electronics makers have created affordable, high-capacity USB packs that range from recharging your iPhone 6s by about 50 percent up to the equivalent of a week’s worth of multiple full recharges of a set of iPads and iPhones. Laptops have typically been in a different category, because they not only have large batteries, but when in use, they draw power faster than previous USB packs typically provide it because of limitation in the previous generation of USB connector and cable standards. In such a case, a Mac laptop pulls juice from the USB-connected battery, but also gradually runs down its internal one. The iPad Pro suffers from this problem. It ships with a 12-watt power adapter that can’t always keep up with power consumed while you’re using the iPad Pro. While its battery could safely be charged at a much higher wattage (at least twice as “fast” in terms of power flow), the Lightning standard appears to limit its maximum rate. USB-C breaks through that limit by allowing higher-amperage charging even though USB has a set limit on voltage. (Wattage is the product of amps times volts, representing the total energy transferred.) This higher amperage can allow a USB battery pack to recharge a 12-inch MacBook relatively speedy when put to sleep, although the units I tested still can’t keep up with its power consumption. OS X requires changes to better recognize the kind of external device providing charge, rather than treating them as a “power adapter” as the MacBook did for all the batteries tested. Being able to bring a relatively lightweight battery (half a pound to a pound) that carries a partial or full additional MacBook charge or could partly recharge a MacBook and handle an iPhone and iPad (some charging three devices simultaneously) can make extended travel away from electricity very practical. This can especially include long-haul flights where onboard power isn’t available or that power isn’t enough to charge devices fully. You would no longer have to camp at an outlet or leave hardware in a vulnerable place to charge via AC. 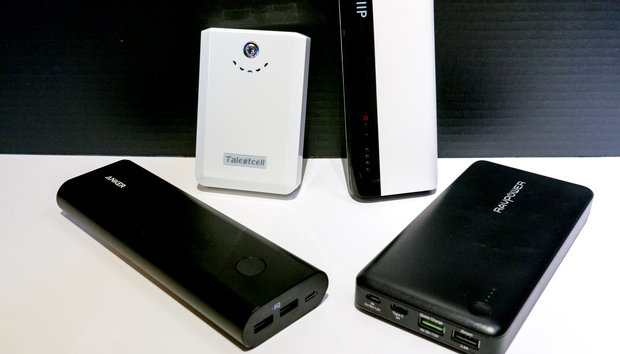 From top to bottom: Talentcell 10400mAh 38Wh Portable Charger, Monoprice Select Series Portable Cell Phone Charger, Anker PowerCore+ 20100, and RAVPower 20100mAh External Battery Pack. In this roundup, I look at four USB packs that feature a USB-C port for charging; some can also recharge through the port. These models appeared on the market starting in fourth quarter 2015, and three are from companies with good track records on electronics, cables, or batteries. (The fourth is less known, but its battery tested very well.) I tasked them to discharge and recharge on their own, and replenish a USB-C MacBook. To read the reviews for each product tested, click the link below. To understand how these products were evaluated, it helps to understand the nuances of elecricty. Unlike the fancy design-to-purpose batteries you’ll find inside Apple products, every USB battery pack I’m aware of uses cells purchased from a battery-making firm. Apple and other companies mold or terrace lithium-ion (Li-ion) polymer batteries to fit every nook and cranny. Mass-produced cells, however, are typically round, like normal alkaline and rechargeable consumer batteries, although they are often much larger. While some small packs use flat arrangement to stay compact—such as Amazon’s super-cheap $6 Micro-USB Portable Power Bank—larger USB packs like the ones I tested rely on standard cylindrical cells and package them with the circuitry, heat dissipation, and connectors needed to move power in and out. If you’re not familiar with power basics, here are just a few. The simplest way to discuss electrical power is in units of volts (V), amperes or amps (A), and watts (W). These can be compared to water pipes and water flow. Voltage is pressure, or the amount of water in a given space; amperage is pipe diameter, which has an impact on pressure. Low-amperage (a small diameter pipe) requires high voltage (lots of pressure) to move the same amount of power as a high-amperage (big diameter pipe) with low pressure (low voltage). Wattage is the product of amps and volts, describing the power (the “work”) passing through the system. As an example, the iPhone 6s battery has 1,715 mAh of capacity. That should mean that a 10,000 mAh USB battery can recharge it about 5.5 times. (For comparison, the iPad Air has a 7,340 mAh and the iPad Pro a 10,307 mAh one.) The single-port MacBook is a trickier case, because its internal battery is 5,263 mAh but at 7.55V. If you do the math, 3.6 divided by 7.55 gets you the factor to multiply against the battery pack’s pack—roughly 50 percent or about 5,000 mAh. So you should be able to charge a MacBook from 0 to 100 percent almost twice with such a pack, right? Lithium-ion batteries can’t be taken down entirely to zero percent. As a spokesperson at Anker, the maker of many batteries and one best one we tested, conveyed from its engineers, “If the battery power is discharged to zero it will adversely affect the durability of the battery cell.” So even when seemingly exhausting a USB battery pack, its circuitry prevents it from tapping out. Li-ion batteries also degrade over time and have a risk of expansion or even fires if they’re overcharged or charged too close to full too fast. (For reference, see all the Hoverboard fire videos from this last fall.) USB packs can charge rapidly at first, but as batteries approach full, they slow down, and stop short of 100 percent—sometimes far short in my testing. To sum up? Batteries can’t give up their last ergs of juice, can’t be charged to 100 percent (and you never know quite how close), and lose power in converting over USB and back. This adds up. In my testing, the best of the two highest-capacity batteries (both over 20,000 mAh) delivered 55 percent of its rated capacity to a MacBook. That was still enough to completely recharge a MacBook battery with some left over, which is magnificent both for performance and by price and weight. But it’s not as much as you’d reckon by using rated numbers alone. I’ll get into this more with individual reviews. Another factor with power is “speed”—in this case, that’s directly related to amperage. Because USB’s voltage is fixed at around 5V, you have to up the amps to move more power, which equates to moving power “faster.” Devices with larger batteries, like tablets or these large USB battery packs, need high-amperage chargers to refill them in any reasonable amount of time. You also need high amperage to charge a device faster than it’s depleting power if it’s in use while charging. Originally, most USB packs maxed out with ports that could each pass power at about 1A, fast enough to charge a smartphone at full speed. But an iPad Air 2 and iPad Pro can charge at 2.4A (and the Pro even faster with a higher-amperage adapter), and iPhones for years charge fine at 1A, but can bump up to as fast as 2.1A with an iPad charger. Faster only works to a point: For keeping their lives long, batteries should only be charged between about a 0.50 and 1.00 ratio of amperage to capacity, which is called its C rating. An iPhone with a 1,715 mAh battery charging at 1A has a 0.58C rating, considered “gentle” and which maximizes cycles. Charge it at 2.1A, and you’re well above 1C, but Apple appears to have factored in, as it allows charging at that high a rate. The USB power packs I tested charge at about 0.15C to 0.30C; future packs might work with higher-wattage cables and adapters for faster recharge rates. Only the Talentcell provided guidance as to the number of cycles it expects for the pack to perform as expected: 500. As with all lithium-ion charging cycles, that typically refers to complete cycles, so depleting to 50 percent and charging to full counts as a half cycle. Finally (whew!) each battery pack has a maximum combined output across all ports. The internal electrical circuitry divvies up charge by port, but also can’t exceed that total when charging through multiple ports at once, like multiple iPads and iPhones. For example, the Anker PowerCore+ 20100 can output 2.4A on its two Type-A ports and 3A on its USB-C ports. With all three ports in use, however, it maxes out at 6A, with no more than 2.4A to any port. Each pack I tested had a different set of ports. Packs around 10,000 mAh typically have just two ports; those at 15,000 mAh or above have three and sometimes four. I’ll run down each port arrangement in individual reviews below. Discharged until it stopped providing power over the highest-amperage port using a USB load generator. Recharged to full using a USB-based gauge to measure that transfer. Charged a 12-inch MacBook from 0 to 100 percent, or as close as the battery would allow. By discharging a battery to its reported empty state with a load generator, I ensured that the maximum possible current that a manufacturer listed for a port worked consistently without causing a battery to shutdown or experience other problems. In some cases that was 2A; others, 2.4A. Because they can pull power at that rate for that long, I know that any phone, mobile, or other device can do the same. Actual hardware pulls varying amounts of current and power, rather than a perfectly consistent continuous load, so should perform even better. None of the tested packs had problems, which isn’t the case with all USB packs on the market. The USB gauge I used (from Portapow) let me measure the voltage and current, and track the time for the entire charging process, as well as see what the gauge measured as total mAh at 5V (or, with Quick Charge 2.0, at 12V). This let me ballpark after factoring in conversion and heat loss that the batteries performed as expected relative to their rated capacity. Unfortunately, there are no USB-C-based power meters yet that are affordable outside of high-end testing labs, so all measurement was done through adapters to the Type-A connectors on the meter, which seems to have reduced recharge speed as none of the devices cross 2.4A in recharging, even when they were rated for 3A. This also tells me how long it will take to recharge a battery when depleted if you’re traveling and need to plug it in alongside or instead of the devices you have. The higher-capacity units really store a huge amount of juice, but when discharged, take an equally long time to recharge. If you deplete a battery and need to use it, give yourself a few hours to get close to the 50 percent mark and from 5 to 10 hours to fill back to 100 percent. All lithium-ion and similar batteries charge most rapidly when they’re most depleted, an effect you’ve seen repeatedly on your own hardware. Finally, charging a MacBook to 100 percent let me see how, in practice, a USB pack would perform in real-world conditions. None of the batteries tested would charge the MacBook while it was powered up. This appears to be a flaw in OS X’s battery management, as it only recognizes external batteries as “power adapters.” Apple likely needs to create a new system-wide profile and a new Energy Saver preference pane tab for these battery packs. I created a test account, logged out of all others, quit all software, and dimmed backlighting—even then, using the USB-C port in each case, the MacBook said “not charging” in its battery display. Therefore, I tested with the Mac in sleep mode. In various separate tests with the Mac active, I definitely extended its internal charge, but not consistently enough to be useful. You should plan to be able to sleep or shut down your Mac for at least 30 minutes, if not much longer, to transfer a useful amount of charge with the current OS X and battery pack interaction. USB-C cables can be designed around a number of parameters, and many early cables that are supposed to carry up to 15W of power fail this test. (A Google engineer has been assembling details and leaving reviews on Amazon; this spreadsheet compiles many of those.) Three of the battery packs tested max out at 3A for USB-C (which is 3A times 5V for 15W), so most power and data cables with two USB-C jacks should work. Talentcell falls short at 2.4A. To eliminate a variable, I relied on Apple’s cable that work with its 29W AC adapter to make sure a cable wasn’t a weak link. The one exception was with the Talentcell, where I used its included male-to-male USB-C, since that’s the intended purpose, and a buyer would be likely to use it as well. Don’t pity the poor battery reviewer, but do appreciate the time involved. These larger-capacity battery packs and the high-efficiency and relatively large battery in the MacBook meant several days of poking and checking on batteries as they charged and discharged. To get a MacBook from 100 percent down to a flat battery, I used the inefficient Chrome browser to stream HTML5 video (the latest SpongeBob movie via Amazon Video’s Prime option) while also running iTunes visualizer and pulling a 1A load from its USB-C port to my USB load tester. Overall, this review took a couple of weeks of continuous testing.